And take responsibility for being the healthiest person you can be. There's a lot to be said about a person who is proactive rather than reactive. There are a lot of people who like to sit and wait til things happen, then there are people who like to do things and then become complacent with the results that were yielded. But as I looked and studied some famous people, I find that they are constantly being proactive. Meaning, they are always doing something now, rather than later. It goes to show that when you jump out there and do something before something happens to you, most of the time something good would happen. Most would even argue the point of, "at least you tried. rather than not doing anything". In today's world, you HAVE to be proactive, there's just no way around it. The world isn't setup for people to have second chances like it was in previous years. One wrong move, one improper plan, and it can all go up in flames that fast. But most people don't realize that, they live this naive lifestyle til something happens to them, then they search for a sympathetic ear. Why is that though? Why do people sit and wait on a bad situation to come? I mean of course you have those situations where you just can't help because it came out of nowhere. I'm more so referring to those times where a person can make a plan and either when something comes up they already have an answer for it, or they can move quickly to find an answer because they were ready. Apart of being proactive means that you're always constantly checking to see what can you get ahead on. Whether it be bills, school work, cleaning, working out goals, planning, there's always something that can benefit from you being proactive. Don't wait til the last minute, when something comes up to be ready and willing to face the challenge. Because being reactive when something comes up definitely can have an adverse effect on your mentality. You start feeling all the emotions of stress, being forced to rush, annoyance, a little depression, oh did I forget the feeling of being stressed. No one wants to ever feel like that, ever. People should really learn how to be proactive these days because if not, then situations will swallow you whole if you let it. That's just some food for thought. 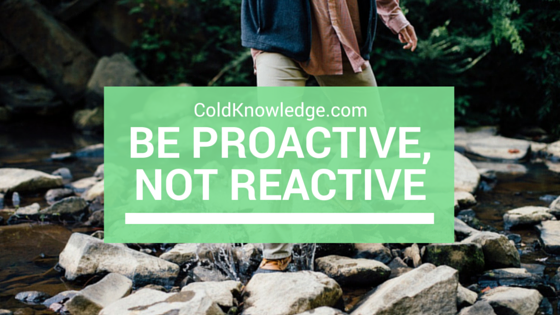 What do you think about being proactive over reactive, is it a good or bad thing?